If you’re in the camp that thinks the mighty cheeseboard is the gastronomic highlight of any occasion, that a burger without a layer of oozing cheese is missing a trick, or a Worcester sauce pepped slice of mature cheddar on toast really can cure all ills (mainly hangovers), then read on for our top picks of our capital’s best shrines to the sweet baby Cheesus. For one week a month, a lovely brie-ze wafts across Clapham North thanks to The Raclette Bar. Taking over The Treehouse at The Clapham North, the masters of melting behind hugely popular Le Rac Shack are back with a full-on cheese sensation. Set your taste buds to salivate and start off with a gorgeously gooey baked Camembert. You heard right, that is indeed just the starter as the undisputed star of the show is of course the raclette selection. Get your melt on with your own DIY (devour it yourself) raclette grill on your table complete with your choice of meats or veg, unlimited fries, potatoes and salad and the added option for an extra cheese or meat board. Because wheezing all the way home is always the benchmark for an excellent meal out. The Raclette Bar is normally a week per month although it will be taking over The Treehouse from 21 November. If you’re craving the silky smoothness only a creamy cheese Fondue can provide, look no further than St. Moritz. Gracing the streets of Soho since 1974, it’s officially London’s oldest Swiss restaurant. Get gooey with a selection of bubbling cheeses and accompanying delights ranging from wild mushrooms to the classic stalwarts of bread and potatoes. In queso emergency, if there are any non-cheese fans amongst you (sacrilege! ), then they can happily indulge in the delectable prime beef fondues and you can all finish off the fondue feast with the gloriousness of the oozing Swiss chocolate fondue. St Moritz is on Wardour Street, Bloomsbury. Despite being located in cool Camden, this is certainly a cheesy place. The Cheese Bar caters to all your fromage related fancies but is undoubtedly renowned for the grilled cheese sandwiches. Whether you’re after the perfect flavour-balance of the Cropwell Bishop Stilton, Bacon and Pear Chutney, or want to tantalise your taste buds with the Queso Chihuahua, Chorizo and Jalapeno, these oozing odes to their love of cheese are not to be missed. Add to this menu heroes such as the poutine with Gringa curds, short rib and bacon gravy, and the Devon Blue ice cream (trust us, it really works) and you’ve got yourself the makings of a dairy-lover’s dream. The Cheese Bar is in Camden. What’s better than enjoying a whole host of cheese? Enjoying a whole host of cheese with a glass of crisp bubbles in hand of course. Luckily, Champagne + Fromage are experts in the answer to that equation. With three charmingly rustic locations in London, be entranced on arrival with over 50 French cheeses to choose from and a range of carefully selected fizz to perfectly compliment them. We’d recommend going all out and ordering both an expertly selected cheese board and a charcuterie board both stacked with grapes, breads and pickles, none of which can be faulted. There’d also be no judgment from us should you choose to also opt for one of their sensational baked camembert’s, our fave is the onion comfit and raspberries. Ideal for all your fromage forays. 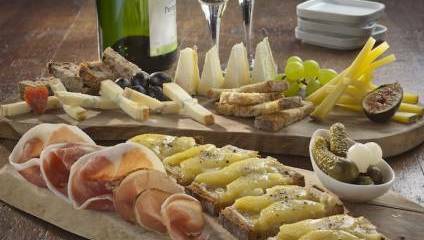 Champagne + Fromage can be found in Brixton, Covent Garden and Greenwich. For serious cheese enthusiasts, La Fromagerie is something of an institution. Their top-notch collections are sought after by the top chefs and restaurants and if you take a visit to one of their shops it’s easy to see why. With cave of wonder walk-in cheese rooms, their long-established stores in Highbury and Marylebone are a mecca for fans of fromage. As an added bonus, they’ve just opened their brand new Bloomsbury location. As well as their shop and cheese room, cheese lovers can now enjoy the café and bar where breakfast, lunch and dinner will be served up daily, not to mention their fantastic take on Saturday brunch. Pulling out all the stops for a cheese feast, think soufflés and fondue, not to mention their incredible cheeseboards sampling the best from around the world. La Fromagerie can be found in Highbury, Marylebone and Bloomsbury.